AmDTuning.com with Cobra Exhausts will look to bring home points for the third Dunlop MSA British Touring Car Championship meeting in succession when the series heads for Thruxton this weekend. The West Thurrock-based team has enjoyed a solid start to the 2017 campaign, with drivers Ollie Jackson and Ant Whorton-Eales having both put points on the board at the wheel of their Audi S3 Saloons. Jackson was perhaps unlucky to leave Donington Park last time out with just a single points finish to his name, having shown strong pace throughout race day in the East Midlands. The 33-year-old has a good record at Thruxton in the past having scored points in four of the six races he has contested in AmDTuning.com colours – including a first points finish at the wheel of the S3 last year. Jackson will be keen to try and add to that record this time around whilst also avoiding a repeat of the heavy accident he suffered back in 2014 at the challenging Church corner. “I’m looking forward to seeing the safety improvements they’ve made at Church ahead of this season, although hopefully I’ll not be making use of them!” he said. “In all seriousness, I feel confident given the way that the season has started, and the aim is to try and bring home some points for a third successive meeting. Rookie team-mate Whorton-Eales heads notched a maiden points finish in Leicestershire three weeks ago, where a strong drive in the second race of the weekend saw him rewarded with a 12th place finish. A puncture in race three prevented the reigning Renault UK Clio Cup champion from wrapping up the Jack Sears Trophy during the second meeting of the year but Whorton-Eales heads for Hampshire keen for another crack. “I’m heading to Thruxton taking the same approach as I did going to Donington Park,” he said. “I just want to keep improving and if I can beat the 12th spot I got last time out, I would be over the moon. “I think that will be a lot harder this weekend, but saying that, the way we are heading with the set-up on the Audi means it should be good in terms of front tyre wear, which is very important at Thruxton. Buoyed by the pace the team has shown so far this season, team boss Shaun Hollamby said he felt confident that both drivers would be able to challenge for points at the BTCC’s quickest circuit. “Thruxton is a proper ‘old school’ circuit, and one that always provides exciting action – it really sorts the men from the boys,” he said. 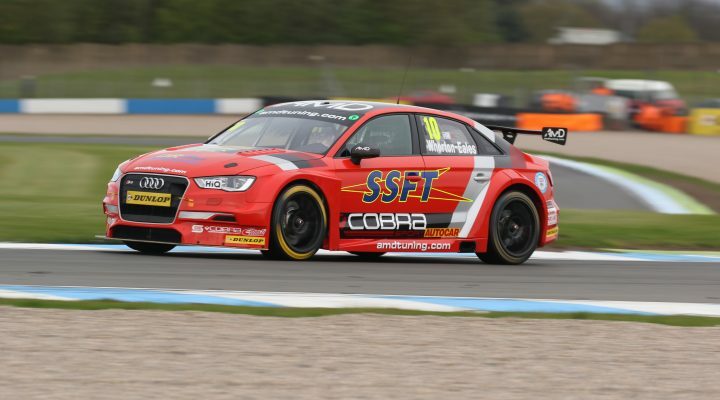 “We go there in confident mood after a strong performance on race day at Donington Park and with a car that should be well suited to the high-speed challenge that Thruxton provides.